Fantasy baseball trade deadlines have either passed or are about to pass and even this deep into the season, there’s still value on many waiver wires. Here are a few players that can help you in the long and short term. RYAN MADSON, RP, Washington Nationals (20 percent owned in CBS Sports leagues) — Madson’s season long peripheral stats may not impress, but with Kelvin Herrera on the DL, he’ll temporarily take over as closer. Madson has experience closing out games and could provide a few weeks of save opportunities. Bid aggressively if you want to grab him off the waiver wire. 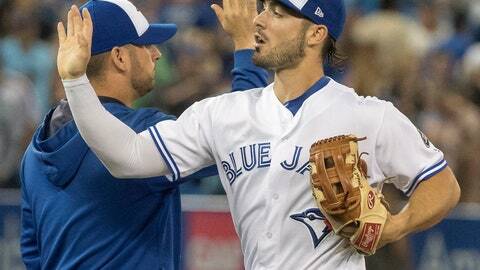 RANDALL GRICHUK, OF, Toronto Blue Jays (28 percent) — Some considered Grichuk a deep sleeper coming into the 2018 season but he slumped early on. By July 13 he had a .199 batting average. He’s turned things around since then, batting .310 with five homers and 14 RBIs. He probably won’t continue to hit for high average, but his power bat could help you down the stretch. MANUEL MARGOT, OF, San Diego Padres (31 percent) — Many expected Margot to have a breakout 2018 season after he hit 13 homers and stole 17 bases in 126 games in 2017. Like Grichuk, he struggled early but he’s batting .329 with four stolen bases in his last 23 games. His speed should help you in the stolen base category but buyer beware; Margot gets thrown out way too much. WILMER FLORES, 1B/3B, New York Mets (15 percent) — Flores is batting .293 with seven homers and 31 RBIs in his last 58 games. Flores can provide your fantasy team with depth. He’s a multi-position eligible player who won’t kill your batting average, and Flores can provide your team with occasional power, too. BLAINE HARDY, SP, Detroit Tigers (11 percent) — Hardy has upcoming favorable starts against the White Sox and Twins. He has a 1.38 ERA in 13 innings pitched (IP) against the White Sox this season, and a 2.77 ERA in 13 IP against the Twins this season. JAIME BARRIA, SP, Los Angeles Angels (36 percent) – Barria has given up three runs or less in 14 of his 17 starts. He has a favorable matchup against the Padres to start the week. He’ll also take on the Rangers, against whom he’s given up just one earned run in 11 IP this season. MIKE MONTGOMERY, SP, Chicago Cubs (33 percent) – Montgomery has given up one run in his last two starts and takes on the Pirates and Brewers this week. He has a career 2.30 ERA in 27 IP against the Pirates, and gave up one run in six IP in his last start against the Brewers. ALEDMYS DIAZ, SS, Toronto Blue Jays (20 percent) – Diaz is batting .440 with three HRs in his last seven games. He’s takes on the Royals, whose pitching staff has given up a .281 average to right-handed batters like Diaz. MARK TRUMBO, OF, Baltimore Orioles (45 percent) – Trumbo has an 11-game hit streak and has a .364 BA with four HRs and 13 RBIs during that time. JEFF MCNEIL, 2B/3B, New York Mets (13 percent) – McNeil was tearing up the ball in the minor leagues and has continued his hot hitting in the majors with a .300 BA in 40 at-bats. He has excellent matchups against the Marlins and Orioles.